I tried to do some more spriting, it was fun to get back into something this old, lol! 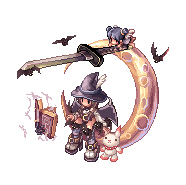 I used parts of other sprites found in Angevon\'s zip files! The new sprites are Bangers! Don\'t use without my permission, thanks. Don't steal, Ask permission to use, Give Credit. Don't Steal, Ask Permission to use, Give Credit! My Version of Artemis, Godess of the Hunt, wilderness and animals. Don't Steal, Ask permission to use, Give cCredit. Female version of The God of War =o Enjoy..
Don't Steal, Ask to Use, Give credit. Female Version of Cupid, God(ess) of Desires and Affection. My Vision of The Godess of Love and beauty, Venus. Please do not steal. Ask Permission and Give Credit. Do Not Steal Or use without my permission. My New Creation. Used Sage's 3rd Level Aqua Summoned monster. It's a Deep Sea Form. A Darker form of Aqua III. -Cuts in the "tail" thingy behind her. -Also Cuts in the "tail" thingy behind her. "OMG how cool Q_Q I fell in love"
But I think from the left version the legs could be more higher. Soo, I was looking at Feiyuen and Mochi's Galeries when I saw those Alice in Wonderland Sprites. So I got inspired and made one myself. -Alice: Alice Mob's Body, Female Hairstyle, White Stockings. -Mad Hatter: High Priest Cloth(green), Magician hat(green with adding of the little card`paper). -Rabbit: Thief Cloths, Recolored it for it to be more brown. Added a brown ribbon at her hand and one at the Rabbit Ears headband end. Credit goes to Feiyuen for Alice's Idea. and the mad hatter's hat is cute. lol. Soo... I made this sprite of Mirajane from Fairy Tail(the manga) in her Take Over Form, Satan Soul. aye sir... so cool... can u give me this sprite? May i use this sprite? Where can i download it sir. I will give credits. -the girl has a doll in her hands and she casts a spell by reading the book. Recolored Priest and added Evil Druid's Cross. Lady Gaga is ugly as hell and annoys me. But your sprite is gorgeous! My God! I like the dress very much!!! DO not steal without permission, thankyou. 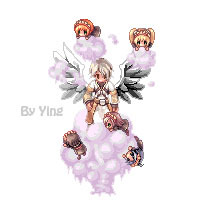 well...this is...a GM character...with custom wings(retribution wings recolored) and some kafra dolls that are everywhere ^-^ Enjoy! wow this is very nice, can i download pls? I really like this one. can i download it and set it as my avartar? bah...c'est mon premier sprite Reussi!!! donc jai decider de le poster! ^^!